With the move of 1AD and 1 ASD, St Omer once again became an operational airfield. This final phase was initiated by the arrival of 4 Squadron equipped with RE8s on 16 April 1918 followed by the SE5as of 29 Squadron on 22 April, the Camels of 210 Squadron on 27 April and the Dolphins of 23 Squadron on 29 April. The latter left within a fortnight but for the next five months there would always be at least two operational squadrons based at St Omer. 4 Squadron was destined to stay at St Omer for over five months, occupying the hangars at the western end of the airfield. Under the command of Major R.E. Saul, it formed part of the Second (Corps) Wing and was employed in direct support of XV Corps. As such, it played an active role in helping to stem the German Spring offensive and in supporting the subsequent Allied advances. As a corps squadron, its RE8s undertook a wide range of co-operation tasks including artillery observation, photography and contact patrols. A high price was paid for this effort. The day after their arrival at St Omer, an RE8 was caught by German fighters and forced to land, both crew being wounded. A further five casualties were suffered before the end of the month, including three killed. Ground and friendly fire also exacted their own toll on the squadron. For example, on 16 June 1918 Lieutenant P. Bertrand and Lieutenant C. Levick were both killed when their RE8 suffered a direct hit from a British artillery shell. It is a mark of 4 Squadron’s dedication, and that of the corps squadrons as a whole, that they continued to perform their role in the face of continuing attrition. On 14 September, just two days before 4 Squadron left St Omer, they lost yet another RE8 to German fighters, the pilot Lieutenant T.O. Henderson being wounded and the observer Second Lieutenant F. Butterworth killed. In all, the squadron suffered at least 40 casualties over the five months at St Omer with more than 10 aircraft shot down. The other units newly arrived at St Omer were all fighter squadrons. 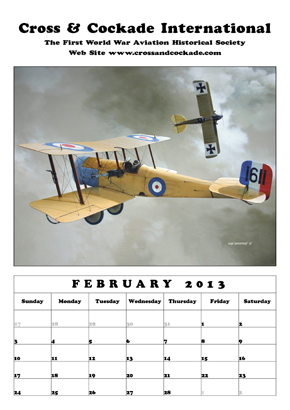 29 Squadron was still working up having recently replaced its Nieuports with SE5as. After a series of initial accidents owed it appears to unfamiliarity with the new aircraft, the squadron’s combat record steadily grew. By the time they left St Omer for Vignacourt on 11 June 1918, some 19 enemy aircraft had been destroyed or driven down for the loss of four pilots. In the event, the squadron’s stay at Vignacourt was relatively brief as they returned to St Omer on 22 July 1918. By now, they were enjoying considerable success and on the first evening of their return three two-seaters were destroyed. A further three victories were scored before 29 Squadron left St Omer for the last time on 1 August 1918, joining the 11th (Army) Wing at Hoog Huis. The Camels of 210 Squadron experienced mixed success during their month at St Omer. Two days after their arrival, they lost a pilot to AA fire while a further two aircraft damaged were damaged on 6 and 8 May 1918 respectively. Although four enemy aircraft had been claimed destroyed by 15 May, the squadron suffered a serious loss when a pair of Camels collided in the air; both pilots being killed. By the time 210 Squadron left St Omer on 30 May 1918, eight more victories (including a hostile kite balloon) had been added for the loss of two further Camels (one pilot killed in action). The departure of 210 Squadron saw the arrival of 54 Squadron, but only briefly, before being replaced by 85 Squadron, equipped with SE5as, under the command of Major ‘Billy’ Bishop. Elliot White Springs has recorded how impressed he was at the speed with which the squadron, having received its orders to move from Petit Synthe in the late morning of 11 June 1918, was packed and on the move within a few hours, the aircraft landing at St Omer later in the afternoon. Notwithstanding later controversy, it is clear that Bishop set an example of aggressive air fighting during his brief tenure at St Omer. Before his departure on 19 June for Home Establishment, he claimed 13 further aircraft destroyed to bring his total score to 72. Five of these victories were scored on his last day in command of the squadron. Bishop’s successor was Major ‘Mick’ Mannock, an experienced fighter pilot with over 50 aerial victories. Mannock did not arrive at St Omer until 5 July 1918 but it quickly became evident that his leadership style was very different to Bishop’s. He spent considerable time in developing more effective combat tactics, building a strong team and, in particular, encouraging the younger and less experienced pilots. Even so, he steadily added to his own total before he was shot down by ground fire and killed on 26 July 1918 on an early morning sortie from St Omer in company with Lieutenant D.C. Inglis – but not before he had scored his 61st victory. The Germans found and buried his body but the site was subsequently lost. He is now commemorated with more than 1,000 other airmen with unknown graves on the memorial at Arras. The loss of Mick Mannock was a severe blow to the squadron, although he would be awarded a posthumous VC in 1919 for his 'fearless courage, remarkable skill, devotion to duty and self-sacrifice'. Mannock was undoubtedly an inspirational leader who left the newly formed Royal Air Force an example of professional airmanship and inspirational leadership that would serve it well in the coming years. Command of 85 Squadron passed to Major Cyril Crowe, another successful ace with 14 victories, who would lead the squadron until the end of the war. 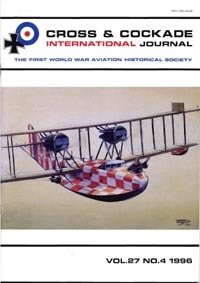 A notable success during Mick Mannock’s period of command was the fight on 24 July 1918 with six Fokker DVIIs (believed to be Jasta 43). At least four of the enemy aircraft were reported shot down – German records indicate that three were forced to land and others were damaged. 85 Squadron was probably the most successful fighter squadron to operate from St Omer during the course of the war. In addition to Bishop and Mannock, other high scoring aces included Capt M.C. McGregor and A.C. Randall as well as Lt A.S. Cunningham-Reid and J.W. Warner. During its stay at St Omer, the squadron claimed over 58 aerial victories (including one Kite Balloon) for the loss of nine pilots killed, injured or POW. 85 Squadron left St Omer for Bertangles on 13 August 1918, being replaced the next day by 41 Squadron, also equipped with SE5as, under the command of Major G.H. ‘Beery’ Bowman. The squadron’s first successes did not occur until 17 August when Capt F.R. McCall claimed an LVG two-seater out of control and Lt W. Shields destroyed a Pfalz scout. However, the day was one of mixed success as the squadron lost one of their most successful pilots, Lt W.G. Claxton, who was shot down and made a POW, as well as Lt T.M. Alexander who was killed in combat. A further 10 victories (largely Fokkers) were claimed during the remainder of the month for the loss of one pilot, 2Lt A.V.F. Trimble, killed in action. September saw a further six claims, including a balloon destroyed in flames by Capt F.O. Soden on 15 September. The transfer of 41 Squadron to Droglandt on 20 September, two days after 4 Squadron had also left S Omer, represented the final chapter in the airfield’s close association with the British Air Services. With the German Army in retreat the fighting was moving steadily out of effective range of aircraft based at St Omer. 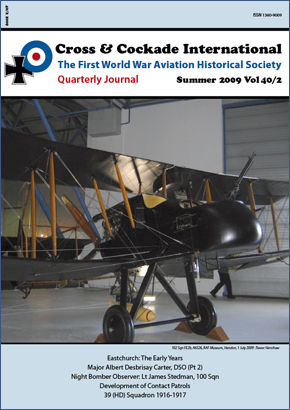 Although some personnel and units remained well into 1919, including a handful of aircraft, the departure of 41 Squadron’s SE5as effectively marked the end of St Omer as a major airfield and closed an intimate association with the British Air Services that had lasted for almost four years.